Are You a Gold Buyer or Seller? When it comes to finding winning investments in gold, silver, oil, gas and other natural resources for my subscribers, I rely on a trusted handful of technical and fundamental indicators. But nothing gives me a better read on the economy, which always has a BIG influence on day-to-day trading activity, than opening up my e-mail and seeing what readers like you are saying. Not surprisingly, thanks to the massive buying opportunity we’ve gotten in gold recently, many of your questions are about the famous yellow metal. Be it gold bullion (bars and coins), gold miners, gold ETFs and other gold stocks, nothing seems more intriguing … or more confusing … than knowing when and how to buy or sell this popular precious metal. You know that I like gold and invest in it myself. Of course, I like it best when I can get it on sale … like it is right now. Many people look to gold as a safe haven when the markets go haywire. Lately, the stock market has made new highs, while gold has tumbled. But for a longer-term investor, that doesn’t make gold less valuable. If anything, it tells me to take advantage of the variety of ways to own gold (including paper gold) because it will ultimately cost more to not have any exposure to it! I like having dollars in my pocket — the more the better. I’m a capitalist — I LIKE capital. But I’m also acutely aware that while paper currencies come and go, the value of gold is eternal. Gold will hold its value in this world long after our bones turn to dust. That’s why Wall Street despises it. To mom-and-pop investors, gold is a real store of value; to budding entrepreneurs, gold shines with freedom. But to the cowards who rule the corridors of power, gold is a warning that the illusions, manipulations and degradations they force upon the weak cannot last forever. That’s why gold generates so much discussion among investors. It’s not that there’s much question about the long-term value of the metal. It’s just how much manipulation might be happening in the broader markets and in the currencies with which we trade them … and how much patience you have to put up with it … that keeps everyone guessing. “Gold is a barometer of how the people of the world feel about the world economy. Gold does not generate dividends … has no balance sheet … and you cannot even see how much of it is being bought and sold since so much of it is between parties who do not want to be known, including certain countries and banks. When it comes to where to put your hard-earned money where it can work its hardest on your behalf, you have some tough questions to answer about timing, pricing and which investing vehicles best fit your needs before you decide to buy or sell. Looking at the chart, you can see that gold is up against two kinds of overhead resistance. One is from the 20-day moving average, which is often seen as a dividing line between short-term bullish and bearish trends. The other is the gap between where gold opened on April 12 and where it opened on April 15. Bears will think (probably correctly) that there could be gold buyers trapped there, and so it will take significant effort to get gold over that level. 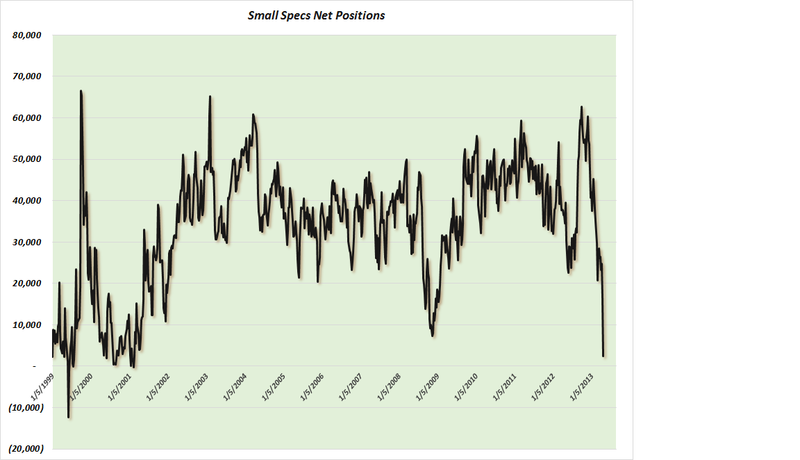 This would explain why the Commitments of Traders report for gold at the New York Mercantile Exchange’s Commodity Exchange (COMEX) shows small speculators’ net long positions are at their lowest levels in ages (see chart). In other words, the small traders/general public is the LEAST BULLISH ON GOLD since 2001 — when gold was coming off a 20-year bear market. Where Do YOU Think Gold is Heading Next? We just released our new investor survey, and the responses are already pouring in. I want you to have every advantage possible when it comes to building your wealth and protecting it while it grows. And the best way I can do that is to know where you stand and what you need to know to make the best investing decisions possible. My special investor survey is easy, fun and takes literally seconds. When I receive your answers, I will automatically reserve a place for you at my upcoming gold presentation. Click here to share your gold outlook with me today! Right now , the trend in PM’s has rebounded slightly , but no bear is without a sucker’s rally or dead cat bounce . Long term I believe gold will explode upward , but when ? Black Swan events are unforeseeable , but the global monetary mess is very evident . How quickly might it unwind ? In the meantime it seems prudent to be a trend follower in other areas preparing for the final bottom . It is possible that many juniors will have credit crises and be gobbled up for pennies on the dollar (based on reserves in the ground ) by the majors before this rout is over . I believe gold won’t move appreciably higher until after the unsettled nature of the world economy becomes generally/widely understood and people begin to believe stability lies ahead. Today,, the world economies are in turmoil and people, including myself, are not optimistic about their futures so we tend to be more cautious than we probably need to be. So we need time to achieve economic stability. But stability WILL come, only I don’t know when. My guess is in about 3 – 5 years. At that point, the value of gold will be less speculative and its true valuation in currencies respected by people and governments will be recognized. My forecast is that gold will end up tripling in value at that time. Larry reckons the collapse was due to deflation and money flows. He seems to have proved right so far when everyone else was buying. I sold half of mine but did not have the courage to short it.. I guess that puts me sitting on the fence! short-sellers of “paper” silver are suppressing the price.